When she doesn't know it. — Georg, from the title song. With Jerry Bock and Sheldon Harnick's blockbuster Fiddler on the Roof once again on the boards, the Roundabout Theater Company couldn't have picked a better time to revive Bock and Harnick's more modestly successful but very fine other collaboration, She Loves Me. For anyone who appreciates delicacy, charm and intimacy in their musicals rather than the big, high-kicking, and splashy kind, there's nothing to beat She Loves Me. While its 347-performance Broadway run didn't hit the big earnings jackpot, it continues to have its followers and deserves a Broadway revival. And when it comes to musical revivals it doesn't get better than the Roundabout Theatr Company's new production of their first ever musical. Scott Ellis, the original version's fledgling director and now the company's Associate Artistic Director, has tapped into all She Loves Me's charms with renewed vigor and flair. With the small but sublime orchestra (how many show orchestras do you see featuring a harp?) positioned in Studio 54's side loges Jerry Bock's lilting melodies surround the audience as a regular orchestra pit couldn't. The subtleties of the music and musicians' location also makes every word of Sheldon Harnick's delicious lyrics crystal clear. 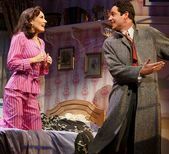 Of course, any She Loves Me revival starts with the advantage of a source that has seeded various popular spinoffs to confirm its durability. That source was Miklos Laszlo's 1937 play Parfumerie . The most famous adaptation was the 1940 film The Shop Around the Corner with Margaret Sullivan and James Stewart and a more recent movie version brought into a more contemporary world as You've Got Mail with Meg Ryan and Tom Hanks. The pen pal romance around which the action and music swirls is between Amalia Balash and Georg Nowack. They know — and dislike — each other in their workday world but fall in love through the epistolary interchanges that began with a "lonely hearts" ad. Watching the inevitable happy outcome unfold for this pair, along with resolutions to some equally predictable problems for their co-workers and boss at Maraczek's Parfumerie, is pure escape entertainment — and as deliciously frothy as one of the show's standout solos, "Vanilla Ice Cream." The predictability of the plot and the lack of killer breakout songs doesn't diminish the show's pleasures. However, for it to win over new audiences it needs a cast that can act as well as sing, a choreographer to make the most of its few opportunities for production numbers, and a set and costumes to evoke a by-gone era and yet be Broadway worthy. Besides a glorious voice Laura Benanti is gorgeous and a gifted comic actor. The debonair Zachary Levi's Georg is the perfect answer to any lovelorn young shopgirl's dreams. He also has a rich baritone voice. The role of their boss, Mr. Maraczek, is a debut of sorts for Byron Jennings, who I've seen give many outstanding performances in straight plays, but never in a musical. Jennings doesn't do the heavy lifting in terms of singing, but he is terrific as the temperamental shop owner and does very well in a brief solo, "Days Gone By." Amalia and Georg's colleagues include Ilona Ritter and Mr. Kodaly, a couple who are definitely not meant for each other — are brought to vivid life by Jane Krakowski and Gavin Creel. To complete the Parfumerie's staff, the always reliable Michael McGrath doesn't disappoint as Ladislav Sipos. Also terrific is young Nicholas Barasch as Arpad Lanzlo, the ambitious delivery boy. His character gets his wish for promotion and Barasch gets a star turn with "Try Me" at the top of the second act. Of course a shop needs customers to survive and the ensemble breezing in and out of Maraczek's add color and spark, as well as some lively numbers like "Sounds While Selling" and "Goodbye Georg." Maybe the Roundabout should schedule some special performances for the many New York retailers whose customers have abandoned them for the internet. With Barnes and Noble reporting improved business and small bookstores springing up, someone should do a musicalized update of You've Got Mail. While there are just two big production numbers each is a wow thanks to choreographer Warren Carlyle. The one at the end of the first and longer act moves the action from the shop to the cafe where Amalia and George are to finally meet. Besides the ensemble's dynamic execution of Carlyle's choreography that scene also brings on the sure-fire show-stopper Peter Bartlett as the cafe's head waiter whose job it is to create "A Romantic Atmosphere. The penultimate "Twelve Days of Christmas" is a case of Carlyle enhancing a less dance infused number.. Whether talking, singing or dancing, the actors playing the key roles and the ensemble players are dressed to eye-pleasing and attention to detail perfection by Jeff Manshie. And David Rockwell's inventive fold in and out scenery allows everyone to move in and out of the store as well as the various other locations. Donald Holder lights each scene with his usual expertize. Laura Benanti with her gorgeous soprano is undoubtedly the show's singing star. That said, however, She Loves Me, is very much an ensemble show. If you're looking for a good time, it's a sure bet that you'll love She Loves Me. Cast (in order of appearance): Michael McGrath (Ladislav Sipos), Nicholas Barasch (Arpad Laszlo), Jane Krakowski (Ilona Ritter), Gavin Creel (Steven Kodaly), Zachary Levi (George Nowack), Byron Jennings (Mr. Maraczek), Alison Cimmet (Customer), Ensemble members: Cameron Adams(Customer), Laura Shoop(Customer), Jenifer Foote(Customer), Gina Ferrall(Customer), Laura Benanti (Amalia Balash), Jim Walton (Keller), Peter Bartlett (Head Waiter),Michael Fatica (Busboy). Ensemble members: Cameron Adams, Alison Cimmet, Justin Bowen, Preston Truman Boyd, Benjamin Eakeley, Sara Edwards, Michael Fatica, Gina Ferrall, Jenifer Foote, Andrew Kober, Laura Shoop and Jim Walton. Musical direction by Paul Gemignani. From 2/19/16; opening 3/17/16/opening 3/17/16;closing 7/10/16.